The existence of a constitutively expressed machinery for death in individual cells has led to the notion that survival factors repress this machinery and, if such factors are unavailable, cells die by default. In many cells, however, mRNA and protein synthesis inhibitors induce apoptosis, suggesting that in some cases transcriptional activity might actually impede cell death. To identify transcriptional mechanisms that interfere with cell death and survival, we combined gene trap mutagenesis with site-specific recombination (Cre/loxP system) to isolate genes from cells undergoing apoptosis by growth factor deprivation. From an integration library consisting of approximately 2 × 106 unique proviral integrations obtained by infecting the interleukin-3 (IL-3)-dependent hematopoietic cell line - FLOXIL3 - with U3Cre gene trap virus, we have isolated 125 individual clones that converted to factor independence upon IL-3 withdrawal. 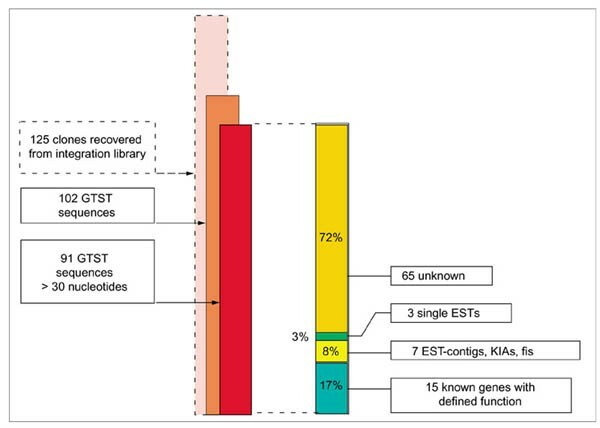 Of 102 cellular sequences adjacent to U3Cre integration sites, 17% belonged to known genes, 11% matched single expressed sequence tags (ESTs) or full cDNAs with unknown function and 72% had no match within the public databases. Most of the known genes recovered in this analysis encoded proteins with survival functions. We have shown that hematopoietic cells undergoing apoptosis after withdrawal of IL-3 activate survival genes that impede cell death. This results in reduced apoptosis and improved survival of cells treated with a transient apoptotic stimulus. Thus, apoptosis in hematopoietic cells is the end result of a conflict between death and survival signals, rather than a simple death by default. The idea of a constitutively expressed death machinery in each cell has given way to the notion that survival factors repress this machinery and, if such factors are unavailable, cells default into death [1,2,3]. This theory is supported by findings showing that many forms of programmed cell death do not require mRNA or protein synthesis. In fact, mRNA and protein synthesis inhibitors can induce apoptosis, suggesting that in some cases transcriptional activity might actually impede cell death [4,5]. To identify genes that are transcriptionally regulated in cells undergoing apoptosis by survival factor deprivation, we used a gene trap approach. Gene trapping involves introduction of a reporter gene into a random collection of chromosomal sites, including transcriptionally active regions. By selecting for gene expression, recombinants are obtained in which the reporter gene is fused to the regulatory elements of an endogenous gene. Transcripts generated by these fusions faithfully reflect the activity of a disrupted cellular gene and serve as a molecular tag to clone any gene linked to a specific function [6,7]. To identify genes that are transiently expressed during a biological process, we developed a strategy, which makes use of the site-specific recombination system Cre/loxP. By combining gene trap mutagenesis with site-specific recombination, it is possible to uncouple a trapped cellular promoter from a transduced reporter gene. This enables the recovery of recombinants even in the absence of an active cellular promoter and thus allows selection for integrations into transiently expressed genes [8,9]. We employed this strategy to isolate genes induced in hematopoietic cells (FDCP1) undergoing apoptosis by growth factor withdrawal . Briefly, the interleukin-3 (IL-3)-dependent hematopoietic cells (FLOXIL3) expressing a reporter plasmid encoding HSV-thymidine-kinase, neomycin-phosphotransferase and murine IL-3, were transduced with a retroviral gene trap vector carrying coding sequences for Cre recombinase (Cre) in the U3 region. Activation of Cre expression from integrations into active genes resulted in a permanent switching between the selectable marker genes that converted the FLOXIL3 cells to factor independence. Selection for autonomous growth yielded recombinants in which Cre sequences in the U3 region were expressed from upstream cellular promoters. As the expression of the marker genes is independent of the trapped cellular promoter, genes could be identified that were transiently induced by IL-3 withdrawal (Figure 1). Identification of transiently expressed genes by gene trap mutagenesis and site-specific recombination. (a) U3Cre gene trap activation from integrations in genes induced by IL-3 withdrawal excises the Tkneo fusion gene, which is flanked by loxP sites from the reporter plasmid pgklxTkneoIL3. This places the IL-3 cDNA immediately downstream of the pgk promoter and enables its expression. This converts FLOXIL3 cells to factor independence. Cre, cre recombinase; Pol II, RNA polymerase II; pgk, phosphoglycerate kinase promoter; lx, loxP target sequence for Cre recombinase; Tkneo, HSV-thymidine-kinase/neomycin-phosphotransferase fusion gene; pA, bovine growth hormone polyadenylation sequence; IL-3, murine interleukin-3 cDNA. (b) Selection strategy for genes induced by IL-3 withdrawal. U3Cre-infected FLOXIL3 cells were first selected in G418 to eliminate integrations into constitutively expressed genes. The G418-resistant cells were then plated into semisolid (agar) cultures in the absence of IL-3. Autonomous colonies were picked and expanded for further analysis. Analysis of several recombinants obtained by this method indicated that cells upregulate survival genes before committing to cell death. As a result, cells receiving a transient apoptotic stimulus exhibit improved survival in a growth factor deficient environment. From a FLOXIL3 gene trap integration library consisting of approximately 2 × 106 unique proviral integrations , we have isolated 125 individual clones that converted to factor independence upon IL-3 withdrawal. Cellular sequences adjacent to U3Cre integration sites (gene trap sequence tags, GTSTs) were obtained from 102 clones by inverse PCR or 5'RACE using Cre-specific primers. Ninety clones yielded informative GTSTs (>30 nucleotides), of which 15 (17%) belonged to known genes, 10 (11%) matched single ESTs or full cDNAs with unknown function and 65 (72%) had no match within the public databases (Figure 2). Interestingly, the frequency of unknown genes recovered with this method was significantly higher than that obtained with a standard gene trap protocol and a similar gene trap vector. For example, only 782 (46%) of 1,687 GTSTs recovered from embryonic stem (ES) cells expressing a U3β geo gene trap virus were novel . This difference is consistent with the ability of the Cre/loxP approach to enrich for transiently expressed genes that are difficult to isolate by standard methodology and therefore underrepresented in the nucleotide databases. Classes of gene trap sequence tags recovered from FLOXIL3 following IL-3 withdrawal. KIAs and fis are full-length cDNAs with unknown functions. Figure 3a shows the structure of the proviral integration sites in the 15 previously characterized genes. Like earlier studies involving retroviral gene trap vectors with a reporter gene in the U3 region of the long terminal repeat (LTR), most integrations occurred in or near 5' exons, although integrations further downstream were observed occasionally. To confirm transcriptional induction by IL-3 withdrawal, polyadenylated RNAs were isolated from FDCP1 cells after various intervals of factor deprivation and hybridized on northern blots to gene-specific probes. 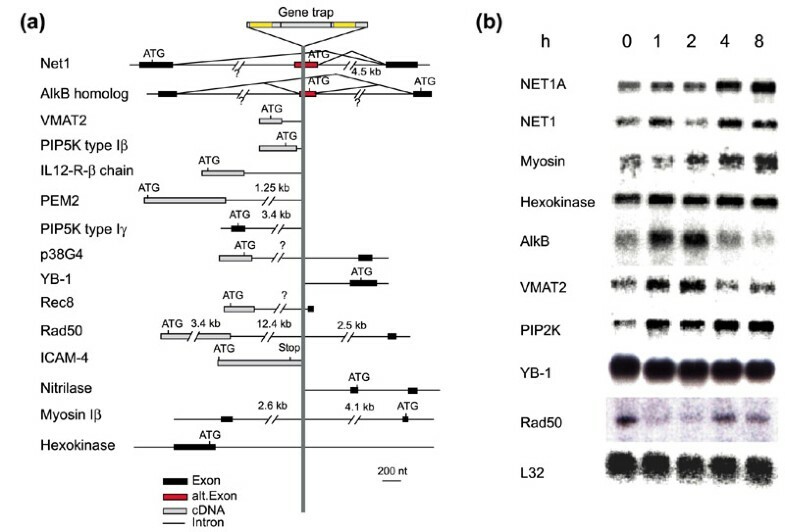 Figure 3b shows several examples of transient gene inductions during ongoing cell death. Genes induced by IL-3 withdrawal. (a) Gene trap position in previously characterized genes. GTSTs were either obtained by 5'RACE or inverse genomic PCR. Exon/intron boundaries were either available from the databases or were determined by RT-PCR reactions using mRNA from FDCP1 cells and exon-specific primers. (b) Northern blot analysis of cellular genes induced by IL-3 withdrawal. Polyadenylated RNAs (5 μg per lane) extracted from FDCP1 cells at various intervals following IL-3 withdrawal were fractionated on formaldehyde-agarose gels, blotted onto nylon filters and hybridized to 32P -labeled gene- or exon (NET1)-specific probes. Blots were normalized with a 32P-labeled L32 probe. h, hours without IL-3. As summarized in Table 1, a significant number of the trapped known genes encode proteins involved in cell growth and survival. For example, the guanine nucleotide exchange factors (GEFs) for the Rho-family GTPases NET1 and h-PEM2 (KIAA0424) [10,11] belong to a large family of proteins that regulate cell growth and can transform cells in culture . Transformation is dependent on the highly conserved dbl homology (DH) domain and in most cases requires amino-terminal truncation of the protein [13,14]. Interestingly, a novel splice variant of NET1, NET1A, which was isolated in these experiments, encodes an amino-terminally truncated protein that is transforming in its native form (Table 1). Thus, when overexpressed in NIH3T3 fibroblasts, NET1A but not NET1 produces transformed foci with typical rho morphology (F.W. and H.v.M., unpublished data). 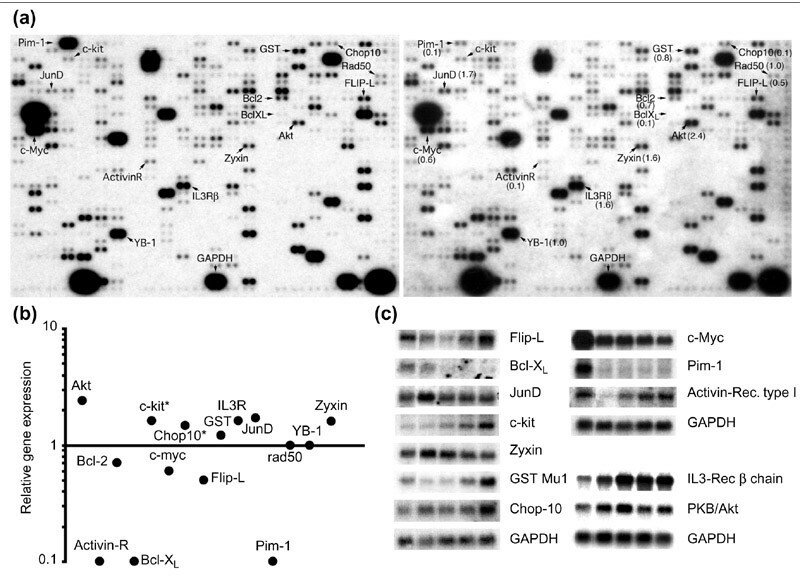 In addition to the DH domain, Rho-GEFs have a pleckstrin homology domain that connects the Rho signal transduction pathway to the phosphatidylinositol-3-phosphate kinase (PI3 kinase) signal transduction pathway . The latter is responsible for mediating survival signals, particularly in hematopoietic cells, and is directly activated by IL-3 . Surprisingly, two members of this pathway, the phosphatidylinositol 4/5 phosphate kinases (PIP5 kinases) type Iβ (which corresponds to human PIP5 kinase type Iα) and type Iγ, were induced by IL-3 withdrawal (Table 1). PIP5 kinase converts the lipid phosphatidylinositol-4-phosphate to phosphatidylinositol-4,5-phosphate (PIP2), which enhances cell survival by at least three mechanisms. First, PIP2 directly inhibits apoptosis by inactivating caspases 8, 9 and 3. Moreover, overexpression of PIP5 kinase type Iα in cultured cells prevents apoptosis induced by caspase 9 or tumor necrosis factor-α (TNF-α) . Second, PIP2 is phosphorylated by Pl3 kinase to give phosphatidylinositol 3,4,5 phosphate (PIP3), which activates the survival kinase Akt. Akt prevents cell death by phosphorylating and inactivating the proapoptotic proteins BAD, caspase 9 and the forkhead family transcription factor FKHRL1, which induces the expression of Fas ligand [17,18,19,20]. Third, PIP5 kinase activates ATP-dependent potassium channels and thereby helps to maintain the polarity of the cell membrane . As shown previously, apoptotic signals can cause membrane depolarization, which leads to cell death by directly inhibiting potassium channels . Another gene with a putative survival function encodes the cell-cycle-regulated protein p38-2G4 (EBP1). Although less well characterized than the above proteins, P38-G4 is absent from Go cells and may stimulate cell-cycle progression [23,24]. Another class of survival genes inhibits apoptosis by interfering with Fas signaling. It includes the IL-12 receptor, which inhibits Fas-mediated apoptosis in certain types of T lymphocytes  and the transcription factor YB-1, which represses Fas gene expression . Interestingly, YB-1 also activates the expression of the multidrug resistance gene (MDR1) whose product, the P glycoprotein, is an efflux pump that eliminates a variety of toxins from the cell, including proapoptotic anticancer drugs . Similarly cytoprotective is VMAT2, the protein product of the vesicular monoamine transporter gene, which moves cytoplasmic monoamine transmitters into secretory vesicles and prevents cell death by sequestering proapoptotic molecules such as MPP+ and histamine [28,29]. Finally, IL-3 withdrawal induced transcription of several DNA repair genes. These were the mouse homologs of the bacterial alkB gene and of the yeast rec8 and rad50 genes. While AlkB protects DNA from damage by alkylating agents , Rec8 and Rad50 are DNA double-strand break repair proteins [31,32,33]. DNA double-strand breaks typically develop at the conclusion of any apoptotic process. Only a few genes upregulated by IL-3 withdrawal (4 out of 15) were not directly related to cell death or survival and their induction may reflect some secondary events occurring during apoptosis (Table 1). However, the low frequency with which such genes were recovered underscores the specificity of the gene trap approach. To further study transcriptional regulation during growth factor starvation, we analyzed the expression patterns of a large number of previously characterized genes in FDCP1 cells undergoing apoptosis by IL-3 withdrawal using Atlas mouse cDNA arrays (Clontech). Atlas arrays contain cDNA probes for 588 genes involved in development, oncogenesis, DNA repair, tumor suppression and apoptosis. Figure 4a shows that of the 588 genes displayed on the arrays, only 12 were differentially expressed after factor deprivation. Differential expression of these genes was reproducible in independent array experiments and could be confirmed by northern blotting (Figure 4c). Differential gene expression in FDCP1 cells after IL-3 withdrawal. (a) Comparative Atlas array hybridization with cDNA probes derived from FDCP1 cells after 0 h (left) and 2 h (right) of IL-3 deprivation. Filters were scanned with a PhosphoImager (Molecular Dynamics) and analyzed with the AtlasImage 1.5 software. (b) Relative changes in gene expression on a log scale. 1, no regulation; > 1, upregulation; < 1, downregulation. Note that the apparent downregulation of Bcl-2 could not be confirmed on northern blots. Induction of c-kit and Chop10 (asterisked) was observed only on arrays hybridized to cDNA recovered from cells after 8 h of factor deprivation. (c) Northern blot analysis of transcripts identified as differentially expressed by the AtlasImage 1.5 software. Poly(A)+ RNA (2.5 μg) prepared after 0, 2, 4, 6 and 8 h of IL-3 deprivation was fractionated on formaldehyde gels, blotted onto nylon filters and hybridized with 32P-labeled gene-specific probes. Similar to the trapping results, several genes with survival functions were upregulated in the absence of IL-3. Among these were the survival kinase Akt, the c-kit receptor tyrosine kinase, the potent inhibitor of apoptosis FlipL, and the IL-3-receptor itself [34,35,36]. Moreover, survival functions seemed to be strengthened by the transient downregulation of the proapoptotic activin receptor [37,38]. In confirmation of previous results, however, the expression of several survival genes appeared IL-3 dependent. Thus, transcripts for antiapoptotic Pim-1, c-Myc and Bcl-XL proteins were repressed in the absence of IL-3 . Finally, only two genes with arguably proapoptotic functions (that is, JunD and Chop10) were upregulated in these experiments (Figure 4c) . Taken together, the gene trap and cDNA array results suggested that the transcriptional changes at the onset of apoptosis should favor cell survival rather than cell death. The activation of protective mechanisms during the early stages of programmed cell death suggested that a transient exposure to an apoptotic stimulus might be favorable for cell survival. Accordingly, a transient factor deprivation should, by upregulating anti-apoptotic gene expression, reduce the FDCP1 cell's need for IL-3. 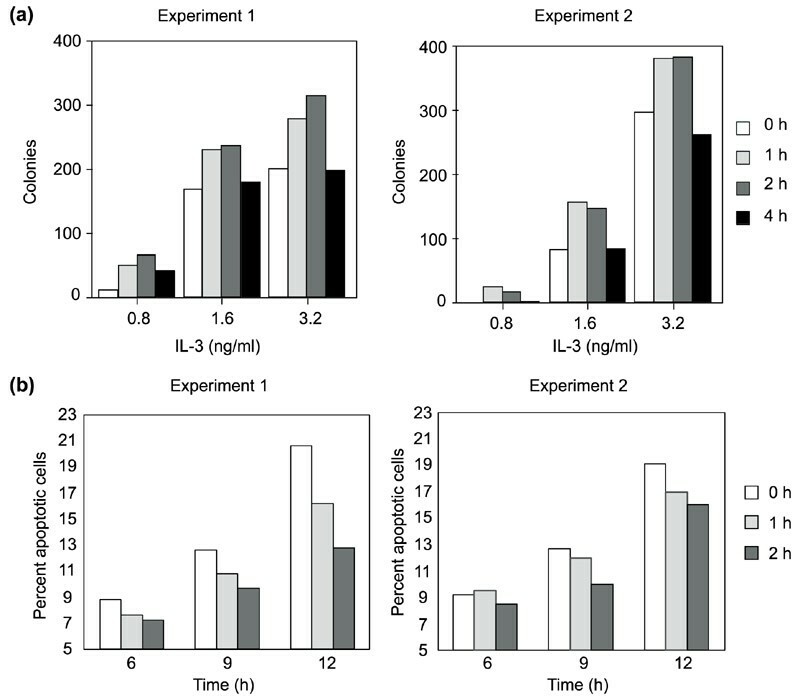 To test this, we evaluated the ability of IL-3-deprived and non-deprived cells to form colonies in agar cultures that contained suboptimal amounts of IL-3. Figure 5a shows that cells pre-exposed to factor deprivation generated significantly more colonies than their non-exposed counterparts, indicating that survival mechanisms were induced by factor deprivation. Whereas growth stimulation was highest in cultures containing IL-3 at concentrations that normally fail to support colony formation, it gradually subsided with prolonged IL-3 deprivation. Improved survival of FDCP1 cells following apoptotic prestimulation. (a) Colony formation in soft agar. One thousand FDCP1 cells were seeded into agar cultures as previously described . After incubation for 0, 1, 2 and 4 h, IL-3 was added at the indicated concentrations. Colonies were counted in duplicate after incubating for 7 days. Results were derived from two independent experiments. (b) Frequency of apoptotic cells. 1 × 106 cells were deprived of IL-3 for 1 and 2 h, respectively. After re-adding IL-3 for 4 h, cells were washed and incubated without IL-3. After 6, 9 and 12 h factor deprivation, the cells were stained with annexin and the frequency of apoptotic cells was estimated by flow cytometry. Results were derived from two independent experiments. In a second approach, we directly tested whether cells pre-exposed to factor deprivation develop increased apoptotic tolerance to subsequent factor starvation. To this end, IL-3 was initially withdrawn from FDCP1 cells for 1 or 2 hours. Subsequently, IL-3 was re-added for 4 hours only to be removed again for 6, 9 and 12 hours. At these time points cells were stained with annexin and apoptosis was quantified by flow cytometry. Figure 5b shows that pretreated cells died significantly more slowly that their non-pretreated counterparts, indicating that apoptotic prestimulation increases resistance to factor deprivation. Like the clonal survival assays, the cell protective effect was highest after a prestimulation of 2 hours. On the basis of these results, we conclude that cell protective mechanisms are activated following growth factor withdrawal and transiently prevail prior to irreversible commitment to death. A gene trap strategy was used to identify genes induced in hematopoietic cells undergoing apoptosis by growth factor withdrawal. This approach enables identification of transiently expressed genes that are difficult to isolate by standard methodology. A comparatively large proportion of unknown genes were recovered, which underscores the strategy's potential for isolating novel genes. In contrast to conventional gene trapping, which tags and disrupts random genes , the Cre/loxP approach allows enrichment for genes induced by specific biological stimuli. As most regulatory genes are expressed in a temporally and spatially restricted manner, we believe that the combination of gene trap mutagenesis and site-specific recombination provides a sound alternative for functional gene analysis in the post-genomic era. As judged by the small fraction of recombinants recovered after growth factor deprivation (that is, 124 of 2 × 106 or 0.006%)  and by the identity of the trapped known genes, the strategy seems highly specific for regulatory genes induced during programmed cell death. Accordingly, the majority of genes upregulated by IL-3 withdrawal were associated with cell death and survival. Although this was similar on the cDNA arrays, the differentially expressed genes recovered with the two methods were quite different. Thus, with the exception of YB1 and rad50, none of the genes displayed on the arrays were tagged by gene trap mutagenesis. Moreover, YB1 and rad50, despite being recovered in the gene trap approach as induced by IL-3 withdrawal, appeared constitutively expressed or even downregulated on both arrays and northern blots, respectively (Figures 3,4). Several factors may explain this difference. First, the integration library used here covered only 25% of the genome. As only seven genes were induced on the arrays (those encoding Akt, IL-3 receptor, glutathione-S-transferase, FlipL, c-kit, JunD and Chop10) their recovery from an unsaturated library was unlikely. Second, transient gene trapping as opposed to cDNA hybridization has no bias towards highly expressed genes. Third, the gene trap strategy selects for real gene inductions and, unlike the arrays and northern blots, is independent of pre-existing steady-state mRNA levels subjected to post-transcriptional regulation. Taken together, these considerations suggest that for the functional analysis of the mammalian genome, gene trapping effectively complements cDNA-based strategies, including cDNA arrays, which are unable to distinguish between transcriptional and/or post-transcriptional changes in gene expression. In terms of apoptosis, FDCP1 cells apparently possess additional control mechanisms that operate at transcriptional level. Whereas in most cells conflicts between prosurvival and apoptotic signals are carried out post-translationally by well characterized proteins (for example, Bcl-2 family members, caspases), there is increasing evidence for transcriptional regulators of apoptosis capable of tilting the balance between the constitutively expressed pro- and anti-apoptotic proteins [20,41]. These transcriptional regulators of apoptosis - still largely unknown - are likely to confer tissue specificity on the apoptotic process. The identity of such regulators is of considerable interest as they could provide valuable targets for prospective anti-neoplastic and/or anti-degenerative drugs. Most genes identified in this study encode cell protective and/or pro-survival functions. In line with this, the biological experiments described here have shown such functions to materialize in cells exposed to apoptotic prestimulation. Accordingly, cells receiving stimulation exhibited improved survival and reduced apoptosis in a growth factor deprived environment. Interestingly, a similar cytoprotective phenomenon known as ischemic preconditioning has been observed in animal models. In this, a short, sublethal period of ischemia induces profound resistance to subsequent ischemic events . Thus, induction of anti-apoptotic gene expression prior to a lethal stimulus seems to raise the threshold required for that stimulus to be effective. This provides an additional safety mechanism that can prevent unwanted loss of cells exposed only accidentally to apoptotic stimulation. In summary, the present experiments have shown that hematopoietic cells undergoing apoptosis by IL-3 withdrawal activate survival genes that do impede cell death. This suggests that apoptosis in hematopoietic cells is the end result of a conflict between death and survival signals, rather than a simple death by default. Inverse PCR from genomic DNAs was performed using the Cre-specific primers described previously  and a combination of the blunt end restriction enzymes SspI and HincII. 5'RACE was performed with 1 μg of total RNA using the 5'RACE kit from Gibco-BRL and the manufacturer's instructions. The specific Cre reverse primers were as follows:5'-TGCGAACCTCATCACTCGTTG-3',5'-CATGTCCATCAGGTTCTTGCG-3' (nested). Amplification reactions were performed in a Perkin Elmer thermocycler and cloned into the p-GEMT-vector (Promega) as described previously . Inserts were sequenced using an ABI 310 Genetic Analyzer (Perkin-Elmer). FDCP1 cells were propagated at concentrations of 2 × 105 cells/ml in Dulbecco's modified Eagle's medium (DMEM; Gibco), supplemented with 10% (v/v) fetal bovine serum (Boehringer-Mannheim) and 5 ng/ml recombinant mouse IL-3 (Peprotech) unless indicated otherwise. Agar cultures were an equal volume mixture of double-strength DMEM supplemented with 40% (v/v) fetal bovine serum and 0.6% (w/v) Bacto-agar (Difco) in double distilled water as previously described . Apoptosis was measured in a FACScan flow cytometer after staining the cells with annexin using the Annexin-V-FLUOS detection kit (Roche) and the manufacturer's instructions. Poly(A)+ RNA samples from FDCP-1 cells were reverse transcribed in the presence of 32P-labeled dATP and hybridized to Atlas Mouse cDNA Expression Array (Clontech) according to the manufacturer's instructions. Filters were scanned with a PhosphoImager (Molecular Dynamics) and analyzed with the AtlasImageTM 1.5 software (Clontech). For northern blots, 2.5 μg of poly(A)+ was fractionated in 1% formaldehyde-agarose gels, transferred onto Hybond N membranes (Amersham) and hybridized to specific 32P-dCTP-labeled probes produced by random priming (Rediprime, Amersham). Blots were exposed to Kodak-Biomax autoradiography film. Cellular sequences adjacent to proviral integrations (gene trap sequence tags; GTSTs) were searched in the NCBI/NIH genomic databases  using the BlastN algorithm. This work was supported in part by grants from Deutsche Krebshilfe and the Deutsche Forschungsgemeinschaft, Bonn to H.v.M and by Schering AG, Berlin.